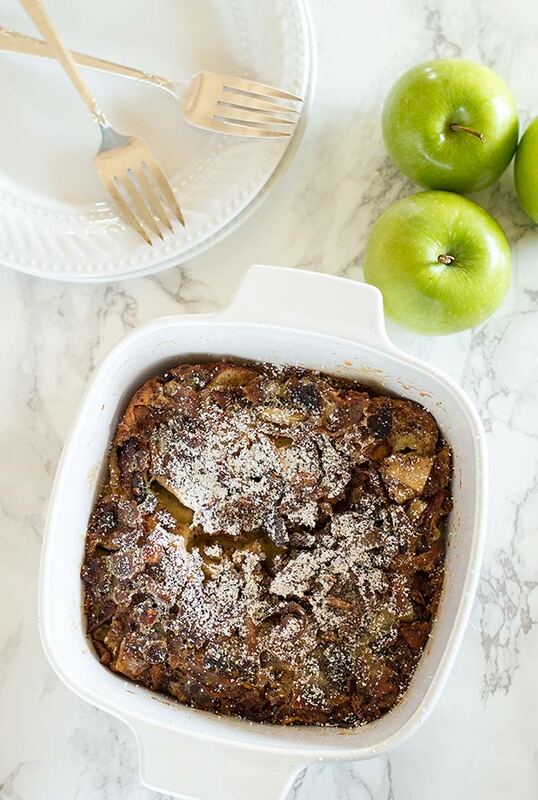 Smokey bacon and tart apples make this Dutch Apple Baby pancake the perfect breakfast for a lazy weekend morning. We’ve reached the penultimate recipe for Nerd Month (more on Nerd Month here) and we’re doing one for Bob’s Burgers! Bob’s Burgers is a bit of an odd duck. I resisted the show for the longest time because animated comedies (with the exception of Archer) have historically not been my thing. But I kept hearing good things, so I finally watched the show when it came to Netflix and found that all the critical praise was completely valid. This is one of the funniest, sweetest family sitcoms on television. It’s not crass or crude like you might expect from an adult animated comedy (not a bad thing, just not usually my comedy jam). It’s a show about a struggling middle-class family full weirdos who love each other. There are great burger puns and the characters are some of the most relatable you’ll find on television. Anyway, during their season four Christmas episode, the family takes a trip to a diner where everyone is just crazy over the diner’s Dutch Babies. I had never even heard of the things before, so I was instantly intrigued. 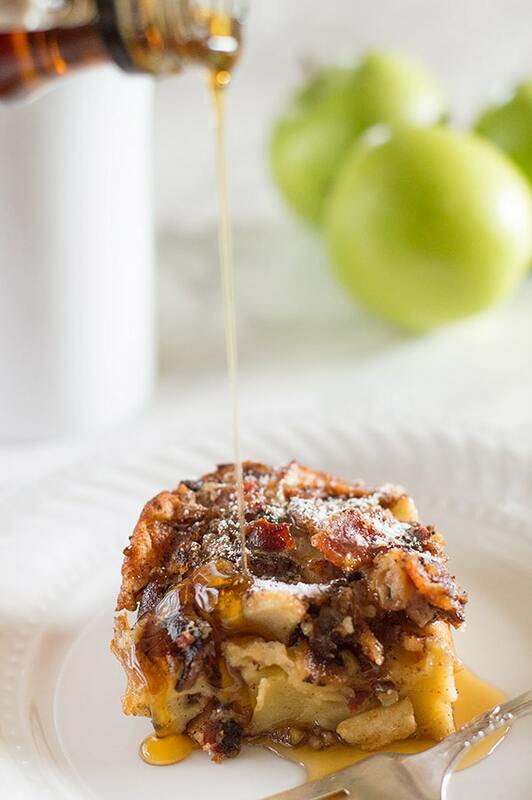 Fast forward to today, and I present to you a BACON Dutch Apple Baby. Oh yeah. This baby got an bacon upgrade. I’m so sorry for that pun. This recipe is for you heroes who insist on dipping your bacon in syrup to the disgust of everyone around you at the breakfast table. I’m one of you, I love you, and I think you are really going to like this recipe. 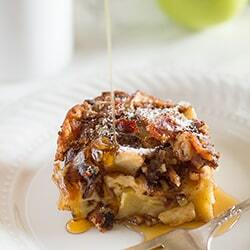 It’s a traditional Dutch Apple Baby with its classic custard base and tart apple filling made even better by replacing the butter in the recipe with bacon drippings and adding chopped bacon over the apples before pouring in the batter. 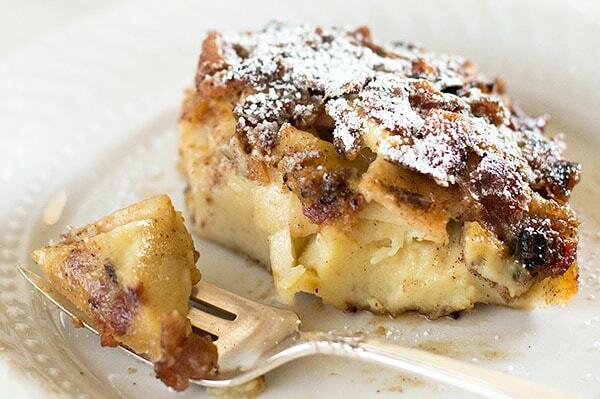 As you get that dramatic Dutch Baby puffing up of the pancake, the apples and especially the bacon rise with it, forming a slightly crisp top layer, so you end up with a breakfast dish that is savory and sweet and smokey, with tart apples and salty bacon in every bite. It’s one of those recipes that you take a bite of it and go, Hmmm. That’s good. 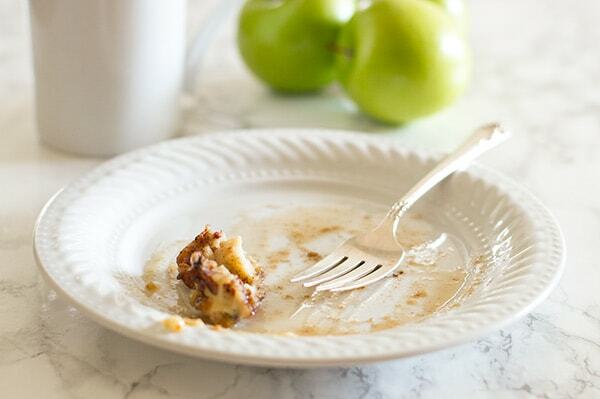 Then you take another and another and another and before you know it, it’s completely gone and you’re crying because you never want to eat anything but Bacon Dutch Apple Babies for the rest of your life. This dish makes two really filling servings for big eaters, or three to four smaller servings. Cook bacon (using your preferred method) until crisp. Transfer bacon to a paper towel-covered plate and reserve the grease. Peel apple and cut it into 1/4-inch thick slices and cut the slices into thirds. Set aside. Combine 1 tablespoon of the granulated sugar, the cinnamon, and ginger in a small bowl and set aside. Pour 3 tablespoons of the reserved bacon grease into an 6x6-inch baking dish. All bacon is different, so if your bacon didn't render enough grease, you can make up the difference with melted butter. Sprinkle brown sugar over the top and add apple slices, spreading them evenly over the brown sugar. Sprinkle granulated sugar mixture over the apples and place dish in the oven until apples are slightly cooked and mixture is bubbly at the edges, about 8 to 10 minutes. While your apples cook, make the batter. In a large bowl, whisk together flour, the remaining tablespoon of sugar, salt, and nutmeg. Slowly whisk in the milk, stirring constantly to prevent lumps from forming. Add vanilla and eggs one at a time, beating well after each. After the final egg, beat for 2 minutes, until mixture is foamy and allow to rest for 5 minutes. Chop bacon into 1/2-inch pieces. Once apples are done, sprinkle bacon over the top and then pour in pancake batter and bake for 15 to 20 minutes, until the pancake has puffed up considerably and is golden and set in the center. The pancake will begin to deflate almost as soon as it comes out of the oven. This is completely normal. Sprinkle with powdered sugar or drizzle with a little maple syrup if desired and serve. *Butter is only required if your bacon does not render enough grease to make the 3 tablespoons needed. Thanks, Miriam! Savory and sweet is def one of my favorite combos!